What is the Framework for Excellence? The Framework for Excellence sets out the principles which all our schools work to. 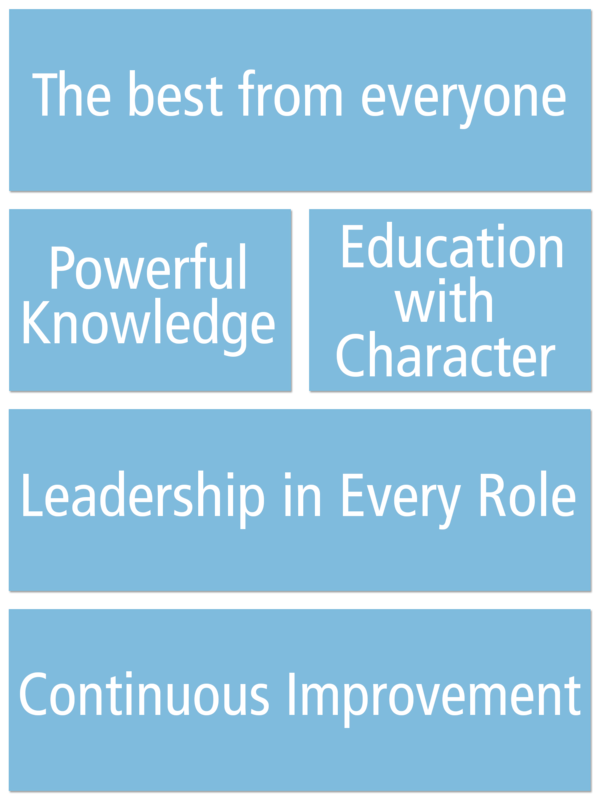 These represent our agreed view of the distinctive approach to education of our group of schools and the characteristics which lead to excellence when exemplified in the right way. The Framework will be the way we set standards for ourselves and assess our progress. As well as this, we are using the Framework for Excellence to create a supportive tool which can be used to drive school improvement. It contains examples of the very highest quality practice drawn from schools across the group. Each of these includes resources, such as lesson ideas and materials, which schools can use to improve their practice. Our aim is to bring out the best in everyone. So we must expect the best from everyone, all the time. Every child is a special individual, capable of extraordinary things. Who can know the limits of any child’s potential? So, we expect unreasonably – we constantly challenge children to do what they think they can’t, to persist, to work hard and to be at their best. From every adult we expect the same: that they are at their best, expect unreasonably of themselves, are determined and resilient and pass those expectations on to the children in all they do. We act with the utmost love, care and good faith – the highest standards come with the greatest attention to the wellbeing of all. Our most important purpose is to teach young people things they would not learn outside school, which free them to think and act more powerfully in their lives. Words and numbers are our most powerful ways of representing the world. Mastery of language and fluent mathematical skills are therefore our top priority. We aim to prepare young people to make a success of their lives: a core entitlement to subject-based learning; the development of talents; an understanding of work and society. Worthwhile learning is often hard. Inspiring teaching is what gives access to difficult concepts and the thrill of intellectual discovery. Powerful knowledge is not static or backward-looking. It includes the ability to critique, challenge the status quo, think and learn. Academic success is very important. Exam passes are an important aspect of that. But there is more to a good education. Our schools also aim to develop character, compassion and service. Young people are expected to contribute to their school and to society; to try things which they think they cannot do; to persist in the face of difficulty; to become resilient in overcoming obstacles; to manage themselves; to work independently on things which challenge them; to work with others and in teams; to be courageous and caring; to lead. We want young people to look back on a joyful schooling which has inspired and challenged them, given them wide opportunity and prepared them for the ups and downs of life. Our children are leaders of the future. We expect them to start today – taking advantage of structured opportunities to lead and taking responsibility for themselves and others. Every adult in the school is a leader. In every word, tone and gesture, they set direction and expectation. We expect every adult to take responsibility and the initiative to do what is right for the children. All those in formal leadership positions create the climate in which others work. They demand the highest standards, build a performance culture, develop their teams and create the space for others to lead. All leaders listen, grow relationships, act with integrity and care and expect the best from themselves and others in building a happy, confident school. However good we are, we can be better. We constantly look for improvements, and implement them with pace. We look for ideas for improvement inside the organisation and out; we observe one another; we steal good ideas with pride and look to make them better; we work together to improve. We always look at the evidence, and are rigorous in evaluating impact. We stop or change things which aren’t working; we improve things which are. We aim for high leverage: high impact for low effort and low cost. We constantly look to have more impact for less cost and effort and to spend every pound wisely.